Antioxidants are the substances that help in removing the potentially harmful substances called “free radicals” from our body. They prevent or stop cell damage in your body. They help in enhancing your body’s immunity. 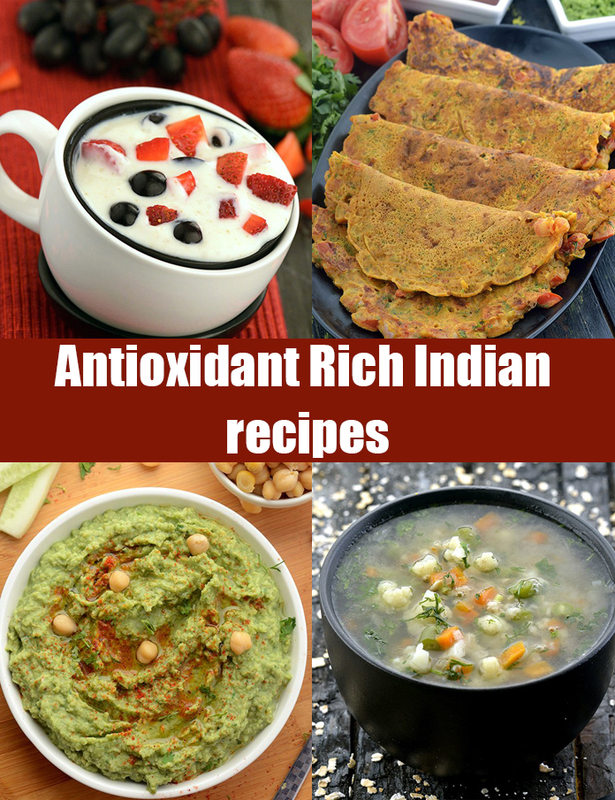 Antioxidants are capable of promoting good health and prevent diseases too. They may help in lowering the risk for infections, heart diseases and certain forms of cancer. They can help in overcoming problems like mood disorders, eye problems, immune system problems etc. Antioxidants have many benefits like flushing out harmful toxins from your system, boost metabolism, aids in weight loss, cleans the liver and improves kidney function, improves skin complexion and prevents wrinkles, gives you healthy nails and hair, reduces fatigue, improves your mood and so on. Antioxidants are present in various fruits and vegetables. 12 Antioxidants with their food sources. 1. Vitamin A Carrots, Spinach (Palak), Broccoli, Sweet Potato, Papaya, Apricot, Pumpkin, Melon, Mango etc. 2. Vitamin C 1. Oranges, 2. Strawberry, 3. Guava, 4. Pineapple, 5. Apple, 6. Broccoli, 7. Cabbage, 8. Lettuce etc. Eggplant, grapes, berries like Strawberry, Raspberry, Blueberry. Black tea, green tea, red wine, onion, Apple, citrus fruits like oranges, lemons, Grapefruit, lime etc. Sesame Seeds, bran, cereals like wheat, oats and Barley, vegetables like cabbage and Broccoli. Corn, dark green leafy vegetables such as Spinach (Palak), Fenugreek leaves. It is best to cut and chop the fruits and vegetables for recipes as close to the serving or cooking time as some antioxidants are lost on exposure to air. An enhanced version of chila, cabbage mini pancake is delicious and wholesome. What is more, it can also be prepared in a jiffy, making it a great start to a busy day. Serve hot and fresh with chutney or ketchup.